Home lighting technology has come a long way in the last few years. LED bulbs have finally arrived in enough shapes and sizes, and a low enough price, that they are finally displacing CFL bulbs. Who knew that another technology would surface to compete with LED? 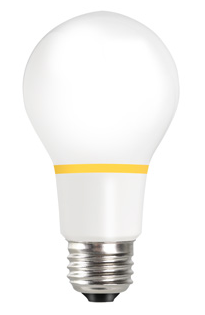 The Finally Bulb uses induction to create a bulb in the familiar incandescent shape and color output but with much lower power usage. Induction light is not new. It was first demonstrated by the scientist Francis Hauksbee in 1705. In the late 1800s, Nikola Tesla patented a system of light that used wireless transfer to power induction lights. Induction lighting is used today in industrial and commercial applications, but hasn't been available for home use due to the large size and space required to make it work (i.e. it doesn't fit in the footprint of your standard consumer light bulb). Most common lighting technologies use filaments or electrodes to bring an electric current into the interior of a light bulb. Induction lighting starts with an insulated copper coil wrapped around a ferrite core. High frequency power from an electronic ballast is sent through the coil to produce a magnetic field which initiates and sustains a steady-state plasma. The plasma generates UV light which is converted to visible light when it hits a phosphor coating on the inside of the bulb. At $10 a bulb, the price is certainly more than a CFL bulb, but on par with equivalent LED bulbs. Time will tell if the Finally bulb really lives up to its name. You can read more about the Finally bulb at Finally Bulbs.